Which way to the beach? Doesn’t matter – it’s full of the burning corpses of a subterranean reptilian horde. Instead of worrying about posing, with our guide you can build the body you really need. 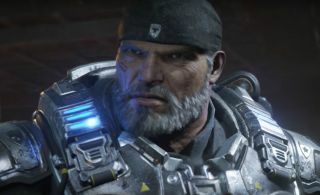 Perhaps, in idle moments between XP-mining on games of Blitz or browsing Forbidden Planet for Marcus Fenix figures, you’ve wondered how it would feel to actually look like a character from Gears Of War. Perhaps not, of course, but in that case, please consider it now. Those boulder-like shoulders! Those python-sized arms! That impossibly-square jawline, topped off by a soul patch that nobody would ever laugh at you for growing! True, you’d never be able to pull off a pair of espadrilles and everyone you ever sat next to on a train would hate you, but that would probably be a small price to pay for having a neck wider than your own head. Shame the Gears are just yet another example of body dysmorphia run amok, designed more like a hyper-masculine collection of squares and triangles than actual humans. Or are they? Well, yes. Yes, to be clear, they are. But at the same time: we could all do with looking a bit more like a Gears Of War character, could we not? (I mean, if you’re a guy.) More to the point, we could definitely all do with being a bit more like a Gears Of War character: capable, strong, able to bounce off walls and carry our own bodyweight in ammunition. So, with that in mind, here’s how to get that Gears body you’ve always (secretly) wanted. Two things here: firstly, bodyweight-only training is a fine way to build entry-level strength and master the basic movements you’ll need when things get more rigorous, with a minimum of kit. Secondly, old lantern-head himself spent the four years after the Battle of Ephrya in jail, losing some of the mass he’d carefully cultivated but somehow keeping in good enough shape to fistfight a brace of guard dogs and fend off a Locust invasion. How? Marcus’s workout plan is lost to time, but actual American convicts – after having their benches and dumbbells taken away via a 1996 bill expressly prohibiting training equipment – do hundreds of press-ups, pull-ups and bodyweight squats, graduating to tougher versions like the pistol squat or archer pull-up as they get stronger. You should probably start with a nice, simple plan: three pull-ups, five press-ups, and seven squats, done ten times with as little rest as you can manage. Just FYI: even though he’s from a different game, you will never be as good as Deathstroke. He keeps going forever. Controlling a Lancer Mark 2 – which, you’ll recall, fires 850 rounds a minute and comes with a chainsaw bayonet – would, for the untrained non-maniac, probably tear your shoulders off. That’s why every surviving Gear has forearms like a bundle of steel cables wrapped in pink clingfilm: they spend half their battle desperately trying not to spray bullets around like a sporting hero with a champagne bottle, and the other time trying to yank a rapidly-spinning blade out of an alien’s exoskeleton while its six vengeful swarm-brothers close in. How to mimic that IRL? Until Microsoft ratchets up the Xbox One’s vibration capabilities to ‘tooth-loosening’, the easiest answer is with dedicated grip-and-forearm training. One option is the “farmer’s walk”, favourite of the World’s Strongest Man competition but also possible with dumbbells or shopping – just cancel the Walmart/Ocado order, load up with tins, and do the Big Shop alone to set your forearms ablaze and build bigger lats, shoulders and trapezius muscles. Another option is ‘fat bar’ training: even if all you’ve got is a set of Argos dumbbells, wrap a towel around the handles (or use a set of dedicated grips) and do your curls (or whatever) as normal. How much COG armour actually weighs has never been definitively established, but considering that the bulletproof vests currently used by the US military clock in at 7.4kg apiece – and that the Gears throw in a load of shoulder-and-arm padding (except in summer) – it’s probably fair to assume that Marcus and the gang are typically hauling around the weight of a fat child everywhere they go, even when they’re sprinting up stairs and leaping off buildings. For the non-military type, the pricey option is a dedicated weight vest – the Raptor, which comes with customisable weight-pouches, is solid. Cheaper is a rucksack full of water bottles, books or little individual sandwich bags full of sand. Either way, doing standard bodyweight moves with your COG-substitute will force your body to adapt, though running extended distances with it on isn’t recommended. Thrashball, national sport of Locust-planet Sera, has an ill-defined set of rules, but it’s essentially like American Football, with specific rules about not dive-punching people in the groin. It’s a fertile ground for Gear-recruitment, with good reason: linebackers, generally speaking, are exactly the sort of men you’d want if you were looking for a squad of behemoths capable of taking a torque-bow shot in the chest with little more than a cracked rib. And how do NFL players train? With heavy weights, short sprints, and high intensity: ideal for mimicking the demands of a game or a sortie through monster-occupied territory. For an entry-level salvo of NFL-style conditioning, set a stopwatch going and sprint 100m, then rest until the second hand ticks 60. Sprint another 100, rest again, and keep going – doing a near-all-out 100m every minute, on the minute, for ten minutes. Too easy? Add three lunges on each leg after the sprints, and run yourself to wobbly-limbed defeat. So far, so functional: but if what all you really want is to look like an over-inflated balloon version of Henry Rollins? Two keys: compound movements and protein. Focusing on moves like the deadlift, power clean, pull-up and overhead press above the biceps curl and triceps kickback doesn’t just save time by hitting multiple muscle groups at once: it also triggers the release of growth hormone and testosterone that’ll give you a boost on the road to jackedness. As for food, most trainers recommend 2g of protein per kilo you weigh (or want to), per day – preferably from natural sources like eggs, meat, dairy products or, um, peanut butter. Too woolly? If all you’re after is something to do, here’s your prescription. Warm up properly, rest at least a day between sessions, and please, please don’t try this if you aren’t confident you can manage the moves without injuring yourself. Coming up next: the Lara Croft workout no handstanding archaeology athlete should miss.